CEDAR CITY – Women in Business of the Cedar City Chamber of Commerce is inviting women to apply for this year’s WIB Scholarship Program for the 2014-2015 school year, applications must be received by the organization by April 1. Last year Women in Business awarded 10 scholarships, ranging from $250 to $1,000, to Iron County high school seniors and nontraditional women students, 25 and older who were entering or re-entering a certificate or undergraduate program at an accredited Iron County university, college, or trade school. This year the Women in Business organization has the opportunity to award even more scholarship funds due to the generous support of the community during their fundraising events at the Pumpkin Festival and more recent Women’s Expo. Scholarships may be used toward tuition, fees, and books. 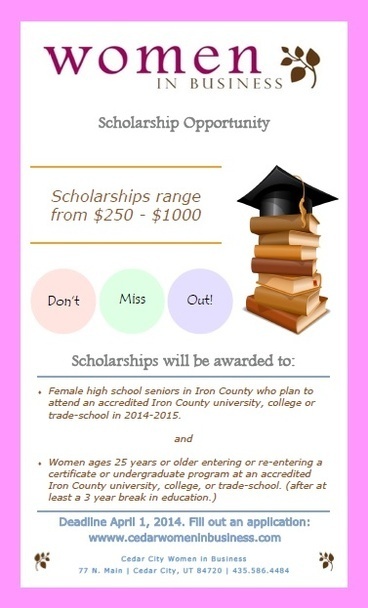 Scholarships are available for female seniors currently attending an Iron County high school and for women 25 and older.Applicants of all eligible ages must be women who plan to attend an accredited Iron County university, college or trade school for the 2014 – 2015 school year to prepare to enter the workforce or further their career. They must be planning to attend on at least a half-time basis (minimum six credit hours). Scholarship applications will be accepted until April 1 at the Cedar City Chamber of Commerce office. Applications are available at the chamber office located at 77 North Main and attached here: Women in Business 2014 Scholarship Application. Women in Business is an arm of the Cedar City Chamber of Commerce dedicated to raising scholarship funds for women and providing educational and network opportunities for women in Iron County. Women In Business hold a monthly luncheon on the third Wednesday of the month at Stonehaven Events Center. For more information on luncheons, scholarships or service opportunities call Deniece at 435-586-4484.